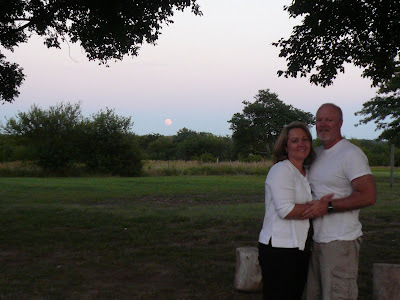 Happy Anniversary Grammy & Pop! Pop and Grammy are both traveling today. Unfortunately not together...Pop is traveling for work and Grammy is in route from SC to the Farm. Ironically, the family friend helping Grammy move celebrates her anniversary tomorrow. Glad they can keep each other company while they miss their men! Pop and Grammy, we all love you so much! We are thankful for your marriage...after all, look what smart, beautiful, funny children you got out of the deal. Wink, Wink. Chuga Chuga Chuga Chuga Choo Choo! In early July, we went on a vacation with EJ's folks (Papa & Grandma). We went to Colorado for a family reunion and found plenty of fun on the way there and back. The boys were beyond excited about riding a train. Their Grandma bought them these little conductor hats in anticipation of our vacation. Don't they look stinkin' adorable. We rode this train from Durango to Silverton. Papa drove the car to Silverton so we wouldn't have to ride the train back. We figured that much train riding would get old for the boys. The cowboys waved and hollered, "Bye, Papa!" as the train pulled from the station. "Four Sisters We Are There!" Pop is working hard to finish up the apartment downstairs. EJ and I are clearing more items from the basement and moving them to storage. Grammy is in charge in SC! She has been organizing the movers, obtaining renters and planning to drive to the farm. A long time friend of ours will be flying out and driving home with Grammy. Another huge blessing! I know this time of transition will be a distant memory before we know it. I have mentioned to Grammy that this whole thing feels too good to be true. I am praising God and thanking him for this incredible opportunity for our whole family. All of the sudden I am thinking about something that happened 4 years ago. Grammy, Pop, and Pretty Princess were preparing to move to SC. All four sisters were together at the house going through our things and clearing them out. It could have been a really sad time. You know, even as a grown child, the idea that your parents are moving the "homestead" so far away is tough. Instead of tears of sadness, there were tears of joy. We tried on old prom dresses and found old memorabilia from our growing up years. We laughed until it hurt. After they were gone, our oldest sister and brother-in-law (DW and Doc), stepped in. They opened their home to all of us. Anytime. They hosted Christmas each year and gave us a place to be a family even though Grammy and Pop's home was far away. We also developed some of our own traditions during that time. Thanksgiving was always spent with our husbands' families but the day after Thanksgiving we (the 3 sisters in Kansas and our families) would gather at a restaurant to eat together. God has been so faithful to our family during this time of separation. Each of our in-laws have stepped up in tremendous ways to bless us. Pretty Princess' future in-laws have done this as well! You all know about the leg incident. Grammy and Pop have sacrificed in many ways to be with us during all the important times. When we look back at the pictures our children will probably never realize just how far away they were! Thank you God as this season ends for our family and our friends. Last week, we got the call we had been waiting for. "This is the post office. We have some baby chicks here for you." They called so early in the morning that EJ hadn't even left for work yet. We loaded up our excited cowboys and headed to the post office. Wubba kept saying, "Babies!" Bubba (the big brother) said, "Mom, I'm going to take care of the baby chicks." We were making such a spectacle of ourselves that while we took these pictures we had a few folks just stop and watch us! The cowboys had so much fun on the ride home. They talked and laughed and hooped and hollered when the chicks made noise. Wubba would stick his finger in the box and then pull it out quickly and say, "Ouch!" Obviously, the chicks were not biting him. What a goof ball. I think the one in the corner is saying, "Are you talking to me?" EJ gets pretty excited on baby chick day too! He has sort of become the "chicken whisperer" around here. Check out the way the yellow chick has her wing around the black one. They must have become BFFs on the long day ride trip to get here. This morning, Lou Lou was with me and the cowboys. We were leaving a building via the elevator. It had been raining that morning and I had my umbrella with me. I asked Lou to carry it for me while I juggled the cowboys. She was happy to carry it. She pointed the way onto the elevator with the umbrella. Just then an older lady appeared and entered the elevator with us. Next thing we knew she was lecturing Lou about the proper way to hold an umbrella. "Put that point down!" She sternly told Lou. "The tip of an umbrella is like a rifle. It could hurt someone! Have you ever been taught how to hold a rifle?" Lou Lou and I were stunned. What kind of weirdo starts yelling at a young lady in an elevator? We both just stood there speechless. As we exited the elevator, the crazy lady said something along the lines of, "Stay with your mother. You are all good kids." This lady had to assume I was Lou's mother. Who disciplines a child in front of their mother? She's lucky I didn't take that "rifle" and beat her with it. Seriously, what is wrong with her? Then things took a turn for the worst...dangerous Lou, points the rifle right at the camera! Next, she threatens..."you feelin' lucky punk?" We had a good laugh and I thanked her for being so kind and respectful to that crazy old bat. Pretty Princess and I took the boys out and went "treasure hunting". We went to more garage sales than I can count. We just kept heading to the next one and let GPS (pronounced Gyps) lead the way. Gyps became a good buddy by the end of our three day treasure hunt. When EJ asked me where we went I told him that we just went where Gyps told us to go! My most exciting find was this Power Wheels Jeep. I got it for $30! For those of you who don't know...these bad boys sell for several hundred dollars. The Jeep served to be a major frustration for 2 days because I couldn't find the right replacement battery. Pop told the boys they have a pretty stinky pit crew! As you can see, EJ really enjoyed pushing the boys around the yard. When I finally got the right battery and charger (which totaled around $91 plus tax) the cowboys were off and running! They love this thing! They drive to the garden, then they drive to check on the chickens, then to the barn, then to the pumpkin patch. Sometimes they drive around in circles just because they can! Bubba is getting pretty good at turning the wheel and knowing when to put it in reverse. There are two speeds on this Jeep "turtle" and "rabbit". As you can imagine we are currently on "turtle". I'd say these smiles are worth the treasure hunt! Wanted for living too far away for the past 4 years. Sentence - they will live out their days at Four Sisters Farm looking after 8+ grandchildren. These little ones will make sure to keep them young and therefore their sentence long. WELCOME HOME!" 2 1/2 weeks has flown by and now it is time for Grammy to fly back to SC. I'm pretty sure a deep dark depression is falling over all of us. We are hopeful her stay in SC will go quickly and she can officially move home soon. Grammy, we promise to take good care of Pop while you are gone. We will miss you! Pretty Princess does have a screw loose!! 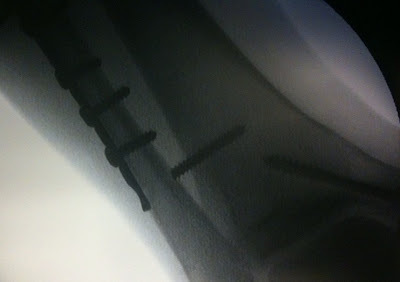 Check out the broken screw! The doctor said he usually only sees this happen in great big heavy guys! Guess that puts our petite Pretty Princess in an elite group! Move over big guys and watch out for the little lady!! 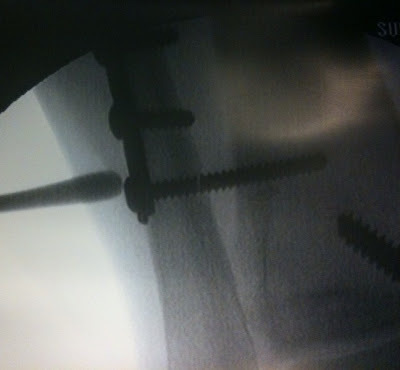 Here is what is left of the screw that may very well require removal later. Hmmmm. This morning, Pretty Princess is having one of the screws removed from her leg/ankle. Please pray for her! She was not looking forward to the procedure but she knows it is another step towards healing. Grammy and Romeo are with her at the surgery center. Romeo and I agree to go see a late showing of the new Transformers movie. We get done with the movie at a crazy 1:00am or so and we begin driving to drop me off at the farm. We apparently headed in the opposite direction of the farm (which I was wholly oblivious to!) and headed downtown. As I see the tall buildings I finally start getting suspicious and ask what we're doing. Romeo looks at me as cool as a cucumber and assures me that we're just going dancing. That may sound strange to most.. especially at 1am... but we had been dancing on a roof top downtown on a previous date, so I still didn't think much about it! As we get out of the car, I notice that Romeo fumbles for something in the car and quickly pulls something out and puts it in his back pocket. Of course I ask him "WHAT... IS... THAT?!" He just sweetly smiles at me and pulls me ahead so I can't peek at his mysterious item residing in his left pocket. I tell myself that maybe we are JUST dancing and that he got me a necklace or some pretty earrings. Looking back now, I suppose I was just trying to tell myself that it wasn't THE ring, so that I wouldn't be disappointed. 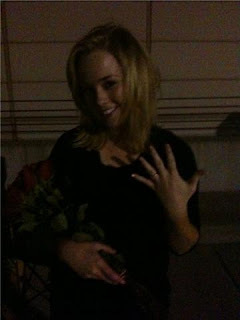 After all... who proposes at 1am?! haha We head toward the elevator and my heart starts beating like crazy! All I could think was "oh my gosh. oh my gosh. oh my gosh!" We ascend up the elevator and my ears are greeted with the sweet voice of Frank Sinatra (which was playing from an awesome 90s boom-box! ha!) Also, I see two lawn chairs set up with champaign glasses, sparkling white grape juice, and two slices of cheese cake displayed at their feet and a beautiful bouquet of roses in their lap. 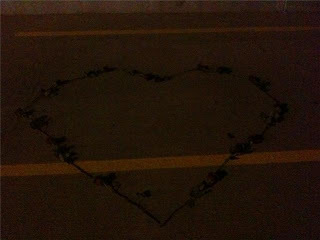 Lastly, there was a heart outlined with even more roses to top it all off! Romeo has never been so calm and smooth! He takes my hand, and brings me into the center of the heart. He drops to one knee, holds my hand as says the following: "Pretty Princess, up until this point, you've made me the happiest man I've ever been... will you continue to give me that feeling for the rest of my life?" 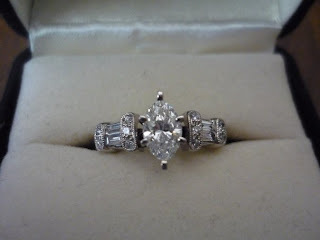 He opens the classic black velvet ring box and reveals what I think to be the most exquisite ring in the entire world! My eyes begin to swell a little with some joyful tears, and I assure him that yes, I will marry him! He removes my purity ring, and replaces it with the new gift and a promise to make me his bride. We end the night drinking our non alcoholic bubbly beverage with our scrumptious cheesecake. And of course... we DANCED! Remember the Patty Duke show? Technically I am too young to remember it but I caught the re-runs on nick-at-nite. You children of the 80's know what I'm talking about! A girl can see from Brooklyn Heights — What a crazy pair! A hot dog makes her lose control — What a wild duet! When cousins are two of a kind." We were "Best Cousins"...you know that is even more than a BFF. My BC and I are only weeks apart in age. We have always been close although never in close proximity to each other. We were blessed to have a family that got together often and our bond was strong from the time we were little girls. We certainly fancied ourselves "identical cousins". My BC had her second blessing baby on April 1st. I just got to meet little X about a week ago. Isn't he a doll baby? I only got to be with them for about an hour and a half. I made sure to snuggle him close and whisper how much I love him. I look forward to times when our children will be together. Love you guys! Whew! It's done! Here are a few pics the first one looking toward the fireplace and the second one at the bottom of the stairway from the mudroom. The colors look different in the pictures but they are actually very similar in real life. If you want info about staining your own concrete I highly recommend this low cost way to do a really stellar floor! There are tons of info on the web - Don't pay big prices for the stain - explore homemade recipes (I used water and Copperas which is brand name for Iron Sulfate which is a plant food so to speak...the only warning on the label is "may stain concrete!"). Basically you clean the floor, stain the floor (multiple layers as desired), clean the floor, seal the floor. It's hard, time-consuming work but it pays off in HUGE dividends in what you save. The Farm Hands dirty but happy. Once again...Huckleberry is not a horse. Baby birds in a nest right above our kitchen window. Sugar and Spice and we have nothing PINK!